Visit beautiful Chincoteague Island and celebrate an annual Christmas tradition – the Chincoteague Old-Fashioned Christmas Parade! The evening begins at 6:30pm with an invocation in front of the Chincoteague Island Library followed by the parade 7pm. 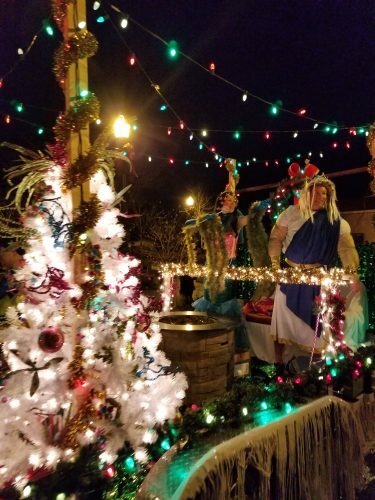 Fill the sidewalks on Main Street from Maddox Boulevard to the Chincoteague Volunteer Fire Company Fire House to see enchanting floats, bands, marching units, decorated boats, fire companies from across the Eastern Shore, equestrian teams, classic cars, and more. Keep an eye out for Santa too! Afterwards the festivities continue at a location to be determined at a later date. Visit with Santa while enjoying refreshments served by the Kiwanis Club of Chincoteague. Cheer for parade participants when trophies are awarded by the Chincoteague Chamber of Commerce. The Chincoteague Chamber of Commerce would like to thank the Town of Chincoteague, Chincoteague Volunteer Fire Company, Chincoteague Police Department, Kiwanis Club of Chincoteague, Chincoteague Island Library, Chincoteague Combined & Elementary Schools and the many volunteers that helped make the 39th Annual Chincoteague Old-Fashioned Christmas Parade possible. We hope everyone had a wonderful evening! Congratulations to all! For parade pictures, please visit our Facebook page. See you next year! Enhance your Chincoteague Island experience with events happening throughout the year; including the Easter Decoy & Art Festival, Chincoteague Seafood Festival and Chincoteague Oyster Festival.